Death Valley. What a name! It conjures images of cow skulls, alkali flats, desperados and above all unrelenting heat. Okay, so that much is true. But there's a lot more to the Valley than the Saturday morning westerns on tv taught us. Would you believe over 1,000 species of plants and 98 species of animals live in the Park's boundaries? Death Valley has the hottest spot in the nation, but also boasts snow-capped peaks, dramatic canyons, and in wet years a wild profusion of colorful flowers. It may not have the green lush beauty of an Olympic or a Great Smoky Mountain National Park, but it's got a quiet and serene peace all its own. Death Valley National Park is huge. It's the largest National Park in the lower 48 states, stretching 150 miles north to south and more than 50 miles east to west. 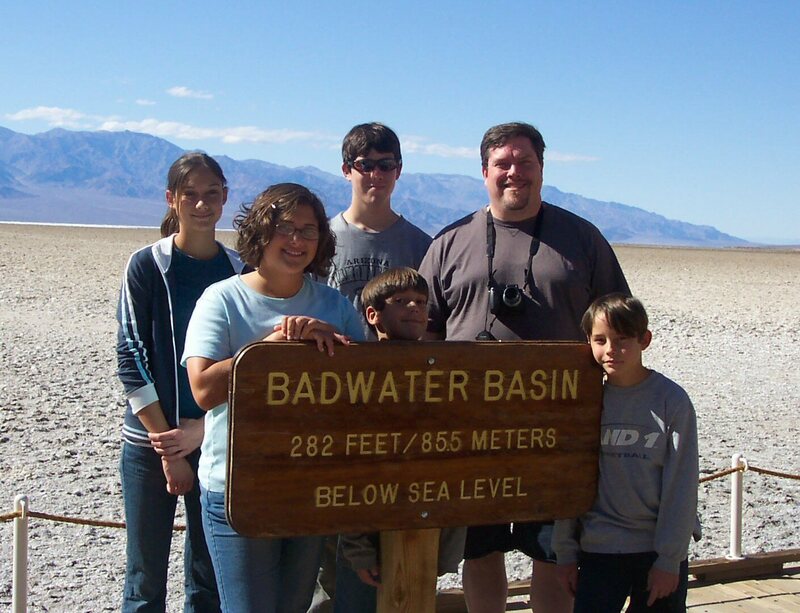 The most well-known sites are in the valley floor, including Badwater, which lies an impressive 282 feet below sea level. 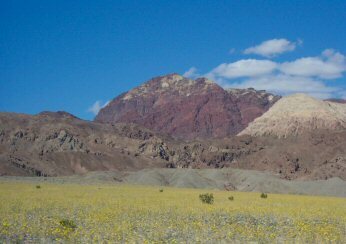 But don't let this fool you -- at least two mountain ranges break up the park into different sections, providing different ecosystems for the variety of plants and animals that call Death Valley home. Don't go in the summer months unless you're a glutton for punishment. Temperatures regularly soar over 110 degrees. And no matter what time of year you visit, bring plenty of water for each person, and keep some extra in your car, for the desert is unforgiving. The best time to visit is October through April, when temperatures are milder. The wildflowers appear in March and April after a rainy year. Don't forget to see the Furnace Creek Visitors Center and the Borax Museum. There are trails for hiking, camping is permitted, as is horseback riding and picnicking. We traveled to Death Valley in March, which turned out to be a great time of year. 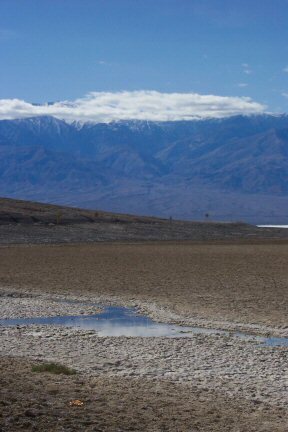 The daytime temperature on the valley floor was around 74 degrees, perhaps a little warmer on the salt flats. Although it's supposed to be a popular park, we had no problems whatsoever with traffic (although it was a Monday). The main road is a two-way winding strip; be careful not to let your speed creep up, for sharp turns are always right around the corner. Most spurs off the main road are graded gravel or dirt, so be sure to check conditions before you go. Badwater is VERY impressive. 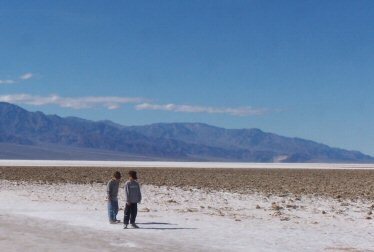 Walk out onto the salt flats that stretch out all around, blasting sunlight back up from below. Imagine how uncomfortable it would be in July! While you're there, have a taste of the fresh salt; it's truly salty. But the best part of Badwater is the sign high on the rocky cliffs next to the parking lot, way above your head, which says, simply, "Sea Level". We'd hoped to be able to see Mt. Whitney (the continent's highest peak, at 14,000+ feet) from Badwater, but two intervening mountain ranges block the view. A few miles north of the ruins of Ashford Mills is Shoreline Butte. We parked here and, before the kids ran down the slope, I pointed out the lines in the hills across the valley. Those lines represented the shore of the ancient lake that once filled Death Valley, Lake Manly. It was hard, and exhilarating, to imagine so much water where now was only desert. A few miles north of Badwater is Devil's Golf Course. Follow the mile-or-so-long graded road to a strange place, where wind and erosion have carved smooth salt flats into fantastic shapes of twisting sharp outcroppings and jagged spires. A sign wisely warns to watch your step; the sharp salty protrusions could easily slash your skin. Take a drive around the Furnace Creek Inn; it's a sight for sore eyes after driving all day over the desert. A natural spring waters the oasis that's been made into an interesting resort, complete with palm trees and grass and tennis courts. At first we thought it was the Furnace Creek Visitor Center, and we were impressed! But the true visitor center lies just a mile or two down the road, and while it has no tennis courts, at least it's a center worthy of a National Park. Death Valley is a large National Park. It would stretch from San Diego to Malibu, from Seattle to Portland, from Manhattan to Baltimore. I seriously underestimated driving time, and as such we didn't get to see a few things I had planned as possibilities. The Artists Palette drive will have to wait for another time, as will Zabriskie Point and Dantes View, and Ubehebe Crater and perhaps Scotty's Castle. That is, if I can convince my family to come back again. While they enjoyed the trip, it was just a desert, after all. 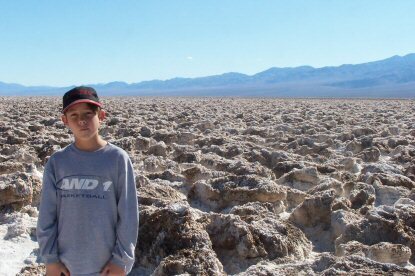 Death Valley is a large Park, mostly in California on the Nevada border, due west of Las Vegas. To get to the Furnace Creek Visitors Center, take Highway 95 west from Las Vegas to Amargosa Valley. 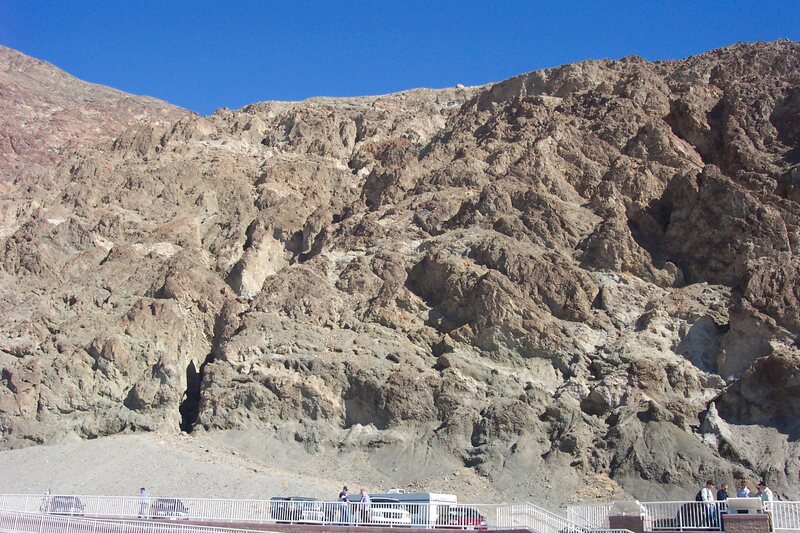 Go south on Highway 373 to Death Valley Junction, and then take highway 190 west to Furnace Creek. 20 miles to the west is Manzanar National Historic Site. A little further west we find some real treasures: Giant Sequoia National Monument, Sequoia National Park, and Kings Canyon National Park. To the northwest is Devils Postpile National Monument, and Yosemite National Park. About 100 miles to the east is Lake Mead National Recreation Area.